Saturday dawned perfectly and continued on the lines of an ideal English summer, all day. Sarah took me and about 18 others into The Forest of Bowland enthusing us with her love and dedication to hay meadows. It is somewhat different to wildflower meadows but the story is similar. Sarah took us to see one of a few hay meadows in the area dedicated an area of Special Scientific Interest, SSI. Here you see the native species growing wild on farm land tended by a farmer who is also dedicated to his inherited treasures. Sarah got us all to collect ripe seeds from the natural flowers growing at the edge of the field. This way we did not trample the meadow but were able to gather many thousands of ripe seeds. Later we all took home seeds in paper bags, lots of recycled pots and trays provided by Peter Foley, with Vital Earth Seed and Potting Compost – yes, really highly recommended by Peter and Sarah as it is peat-free, has been pasteurised and has very few nutrients. This kit will enable us to propagate and replace these species into more local pastures the coming years. When the time comes in spring 2013 we will sow our indigenous seeds in pots and later in 2013 transplant to the edges of another field locally and spread the goodness. Interestingly we transplant to the edges of the field where in their first year they will not get as easily trampled and damaged by sheep. These are really hardy plants and will take lots of weather and constant animal passage, but it will give them a better chance to establish and seed naturally as they grow in populations. Collect the seeds in a paper bag, labelling the bags with the names of the meadow flowers. Some need more care if they shoot out all over the place as soon as you touch them. Not all seeds will ripen at the same time so more than one visit will be needed to get the range. Keep them in a cold, dry and dark place until February/March. This can be in a container in the fridge so that they go through the natural cold winter conditions. It can be in a sealed tin in the shed, but dry, cold and dark is important. If they get wet or warm they may start germinating and if it is too early for spring they will not survive. In early spring sow seeds on the top of a tray or pot of seed Compost just how they would fall naturally to earth. Because of the nature of their natural environment Wildflower seedlings are robust. Preferably use Vital Earth Seed and Potting Compost because it is suitably low in nutrients and it is without peat. Do not plant seeds below the surface! When seeds fall naturally they arrange the depth they want to go by themselves. Water with a fine rose or you will just wash the seeds away! Protect from predators with a light covering of fine grit, Perlite or woodland bark. Transplant when the roots are strong into cleaned pots, washed with mild soapy water preferably something non bio. When transplanting, be sure to plant firmly. Firm them down well at the edges of the pot and again after placing the seedling. It is a mistake to put them in delicately with loads of air pockets where the roots cannot grow and then walk away. It avoids air pockets where the roots will not go. Water with a fine rose. If planting shrubs you should use the heel of your boot to firm in. Again it is good to cover the surface with a light dressing of fine grit, Perlite or a bit of woodland bark. We’ll keep you updated on our process and look forward to sharing the pictures of our beautiful new plants. My weekend was spent picking soft fruit. The sun came out and everything seemed to ripen the same day. The sugars are not as well developed as I would have liked, but the volumes and size of the fruit evokes envy in all who see. I panicked with the thought of preparing and consuming all this produce. Jam is rather a fiddle and there is too much for one person. Next door will eat lots, but they have their own crops as well as access to mine. So I bought a Mehu Lissa steamer/Juicer on Monday morning. It arrived Wednesday and wow I am so thrilled with it. I admit my first thought on opening it was that I will use the steamer to steam a mega huge treacle pudding the next time we are all together. Now how to use the by-products of the juice, sauce and jelly making. The book tells you how to make jam from the remaining pulp but yes, you are left with about a ¼ pan (large pan) of mixed stalks and spent fruit mush with the seeds or pips. Tempted to chuck them on the compost and be done I was challenged by the Batman, who made a visit in the middle of all this, to make it into something and not waste it. He thought it looked good. So I put it into a smaller bowl and covered it with some white distilled vinegar. It does not have to be white. It just looks better. Left it about 3 days and strained off the clear pink vinegar liquid. Add some sugar, about 0.125kg to a litre. Boil up quickly to incorporate the sugar and pasteurise. Taste it for sugar and bottle. Yes it is really fresh tasting and good used on summer salads as part of a salad dressing. Now surely I can put the rest on the compost without feeling I have wasted food. Being vinegary by now the mush will not attract any unwanted scavengers to the compost. It will decompose in a few days anyway. 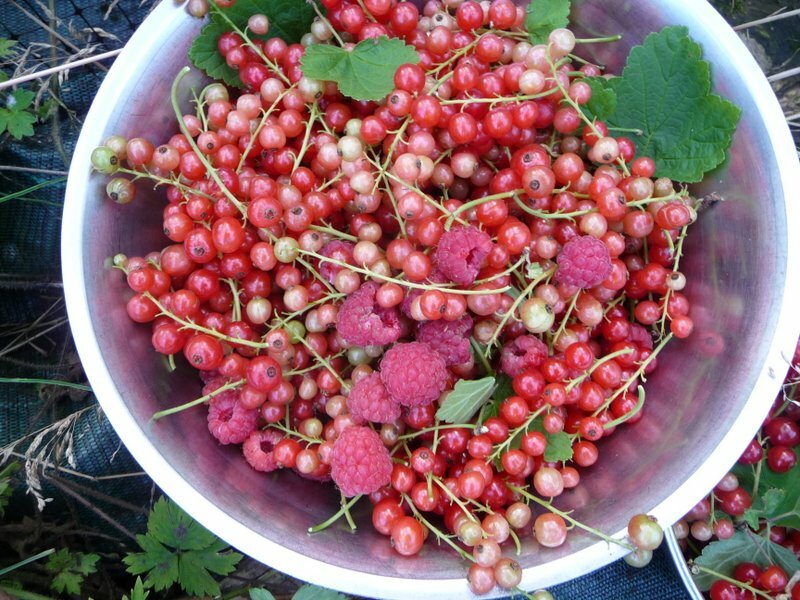 So far this week Goooseberries, Raspberries, and Rhubarb have been harvested as well as many Red, Black and White currants you can throw a stick at. I was too late for the Strawberries this year but I have all the top fruit to go for soon. There is still a lot of top fruit produce in my small garden to go for in the coming weeks, even though some of the plum trees lost out completely on pollination. All the Cherries have been completely stolen. Sadly those beautiful Weck professional preserving jars have sold out but I can still get the Screw Top Bottles for all the pasteurised sauces, cordials and vinegars. When the apples and tomatoes are ready I will need them for all the different juices and chutneys I plan to make so I will buy a box or two of the bottles and search for all those honey jars in the attic. This time I plan to have the whole lot stored on the shelf in a couple of hours or less. To finish I must tell you that there was NO MESS at all. I did not drip anything. There was no jelly bag. No sticky steering wheel, telephone or computer keypad and my hair did not get sugar in it ether!